Love Into Action (LIA) exists to care for disabled people, mainly young people. This is done be taking the children for short breaks for intensive therapy and training at the Beit Yusef Respite Care Centre and by trying to teach families how to better care for the young people in their homes. Children who have disabilities are often treated very badly within their families. They are left to themselves often chained to a bed or a pole in the yard. They are given little food, love or protection. Their families are incapable of caring for them and have few resources to put into specialist care for them. LIA moves throughout the West Bank in community outreach, identifying families with children like this and then attempts to intervene. They are now beginning to become known and are having families referred to them as they are the only group dealing with the issue in a way that keep families involved and empower them. They employ a few people to care for the children when they are in residence at Beit Yusef Respite Care Centre. LIA was established in 2011 out of necessity. Laurence Garnett is a nurse and for a number of years travelled and worked in the Middle East. Through contacts at Bethlehem Bible College (BBC) he heard of an organisation, actually established out of BCC, that was caring for blind and disabled children. Over a period of time he communicated with them and visited and was invited to come and lead the charity. By this time, he could speak Arabic and was married to Sharon with three young children. They planned and eventually got on a plane however literally while they were in the air, the organisation in Bethlehem changed their minds and when they arrived there was no position for them to fill and nothing for them to do. Because they felt called to the work and this group of people they decided to form their own charity. This happened in 2011 and they slowly got underway. BHW's Middle East Partnership Facilitator had visited BCC a number of times and heard about the work Laurence and Sharon were doing. On a visit to Bethlehem with BHW's New Partnership Facilitator in November 2015 they went to visit Love Into Action. They were very impressed by the clear vision, the networks they had been able to develop, the lovely atmosphere in the place and the genuine love for those being cared for. Over the next 12 months our New Partnership Facilitator was in ongoing contact with Laurence, receiving communications, stories and photos of the developing work. The ministry left a deep impression; the scale of the problem, the lack of help available and the shocking treatment of disabled people in their families. In November 2016 another visit was made. It was obvious the work was growing and that their real need was for regular support for the ongoing, day to day costs. In May 2017 it was decided to commence partnering with Love Into Action. The primary beneficiaries are the children who become part of the programme and also their families as well as the relationship grows and trust develops. They say that working with the families is by far the greatest need but is the most difficult thing to do. Currently there are about 50 families in the programme but it is growing by the day. At the end of 2016 there were 12 children in the centre bi-weekly but early in 2017 this will become 12 children each week. Their aim is to take it to 50 children per week. The people they are serving are as poor and vulnerable as it is possible to imagine. They are literally "hope-less." They see such potential in these children and are motivated by Christ's love to release them and their families. Laurence and Sharon Garnett were married in February 2006 in Plymouth, England. They met through their local church. Laurence worked for a Christian project working with homeless women and Sharon worked as a primary school teacher. Three years into their marriage, Sharon gave birth to twin daughters Amy and Rosie and eighteen months later Andy also made an appearance. In 2010 Laurence and Sharon had a strong calling from the Lord to move to Bethlehem to support families with a disabled relative as a way of coming alongside people and sharing in a very practical way the love that God has for each of us. They therefore established the ministry of Love into Action and intend to continue on with this work for as long as the Lord allows. Alongside the Garnett's there are a number of local people who are employed to care for the children who come in each week. There are also casual international volunteers who hear about them and who come for extended periods, usually months at a time. The ideal people are those who have training in the care of children who are physically, emotionally and mentally challenged. They need to be able to work in trying conditions with a servant attitude and to serve the whole community. Physiotherapists and occupational therapists are also very useful. The vision is clear: They want to continue this ministry until there are no children in chains in Palestine. 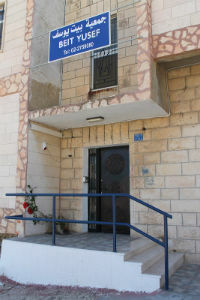 1) Beit Yusef (House of Joseph) Respite Care Centre, Shepherd's Field, Bethlehem. The centre building is rented and had been empty for 12 years prior to them taking on a long term lease. Throughout 2014 the building was renovated in order to make it a safe and suitable home for those who receive the respite care. 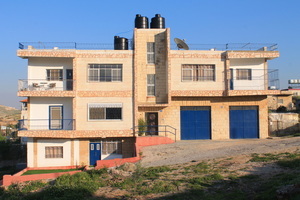 Every week a different small group of profoundly disabled young people are brought to Beit Yusef to provide them a short break (4 days) from their families. Each group returns every eight weeks. While at Beit Yusef each young person works on their individual targets, and assessments on their progress are carried out. Most importantly though, during their time at Beit Yusef they experience fun in a loving and safe environment. During the 8-week cycle they are also visited in their home by members of the team and progress is shared with their family. Each family is shown a range of activities which could be carried out with their disabled relative and support and advice is gently given. They have already seen incredible progress even from the most severely disabled young people and they are seeing changes in some of the families regarding how they treat their disabled relative. 2) The Olive Wood Project. Without a job to bring home an income, people with special needs are considered to be a burden by their family. Within the Palestinian Territories there is no financial support for anyone who does not have a job nor is there any support or advice for those seeking to find a job. The Olive Wood Project supports these people in their employment enabling them not only to earn an income for themselves, but also to learn many life skills to support them in all aspects of their lives. The workshop is based in the heart of Bethlehem and provides meaningful employment for adults in the Bethlehem area who because of their disability need that extra help, support and training to both learn a craft and to keep a job. Gifts available from the workshop include nativity sets, candle holders, cross / crucifix, Christmas ornaments, and much more. - Fuel for the vehicles to pick the children up and deliver them back home. Also for the visits to the homes throughout the 8-week cycle.